Today was the best Tuesday I've had in a L-O-N-G time. Mickey "had" to come home early from work because someone left her softball gear in his trunk and she had all-star practice this morning. Now he could have met her at practice, which is between work and home, but he opted to come home because it was so nice out. (And it was a beautiful day!) Mickey worked a little more from home and called it a day. While he worked, Kade and I rode our bikes to his school. We are planning to ride them every nice day this year. I figured I had better get Kade trained for it since we have lots of hills on the way. The way there is more down hill and the ride home was a little difficult. Kade had to walk up a few hills. Hence the need for training. After we got back Mickey became a slave driver, sending us all out to the jungle, or what most people call the yard. Mickey mowed and edged, Meg picked up sticks and weed-eated, Kade swept up all of Mickey's grass clippings, and I trimmed several bushes that have grown about two feet since I trimmed them last year. Mattey somehow got out of working. At one point in the day Kade wanted a sandwich. This is what he wanted. 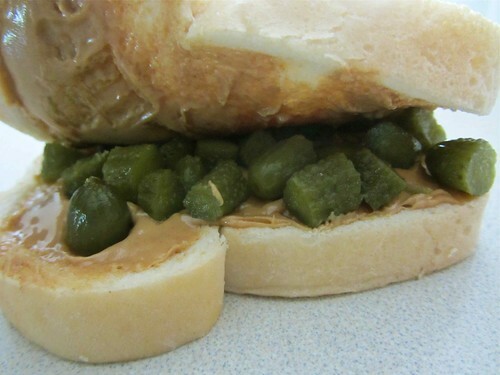 Peanut butter and pickles. (I think this is so gross. Now I've never tried it but the title ruins it for me.) This is something that Mattey and Kade both eat. They so got it from Mickey. He got this interesting combination from his grandma. After the work was done we all went to the pool for a few hours and then picked up some dinner before putting the kids to bed early, or at least earlier then they have been going to bed. Then Mickey and I could relax and watch an episode of Covert Affairs. That does look gross!! I never knew Mickey or Grandma liked this!! Maybe I'll have to try it.